EGAA is almost always open for business no matter how hard Mother Nature tries to interfere, so it is the most ideal destination, fuel stop or alternate airport on the North Atlantic Eastern Seaboard, Northern Europe. Jet Assist has Aircraft Parking available at any location without restriction on the Civil side of the airfield. We can also make use of the southern side of the runway with prior arrangement with the Airport Authorities. Delta Apron is a large remote area located on the Western boundary of the airfield. It is outside the Critical Part of the Airfield. Access to this apron is via a Self Controlled Secure Gate. Aircraft on Private Owner-Opertor flights and those Charter flights under 10,000 kgs MTOW are able to use this Apron if they wish to. This Apron is large enough to park a Boeing 747-400 or a number of Gulfstream's with plenty of wing tip clearance. The Main Apron is within the Critical Part of the Airfield. 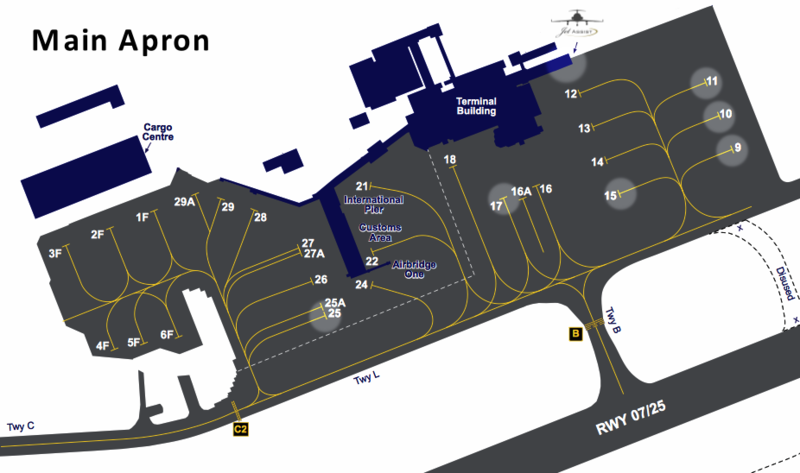 Access to this area is available directly from the Jet Assist via our In-FBO Security Suite. Aircraft over 10,000 kgs MTOW on a Charter flight must arrive and depart from the Critical Part. The highlighted areas are the parking stands which we use on a regular basis, some of which are roll-on-off enabling quick Tech Stops. The most ideal area for your Aircraft Parking is the secure Main Apron. All access is controlled, there is dedicated marked parking areas, it is fully lighted and under CCTV coverage.